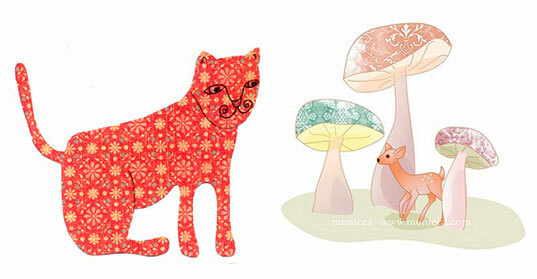 Etsy shop owner Munieca‘s delightful paper prints, illustrations, and collages are comprised of animated colors and simple designs, making them perfect patterns for any child’s space. These silhouetted creations are child-friendly, but not childish – meaning parents will love living with them too. The nature-inspired Patterned Birds print (above) is an original Munieca digital illustration. Recycled retro patterns are used for the colored feathers of the birds, and all images are sent by the designer, ready to be framed and displayed. Decorating babies and kids’ rooms has limitless possibilities, but we love unique designs such as Munieca’s, which foster imaginative thinking and cultivate an affinity for the natural world. Munieca prints are affordable accents for a nursery, child’s bedroom, playroom, or even a for nicely lit reading corner. The enchanting Bird House print (pictured below) is totally adorable – definitely one of my favorites. This design would be ideally showcased in a natural colored wood frame – maybe even above a nursery crib. The lovely Tea House design would also be charming decor for a little girl’s room. All prints at Munieca are well-priced, original, creative, and unique art investments. We are big supporters of the DIY spirit when it comes to design and decorating, and Etsy is a great source for original ideas. 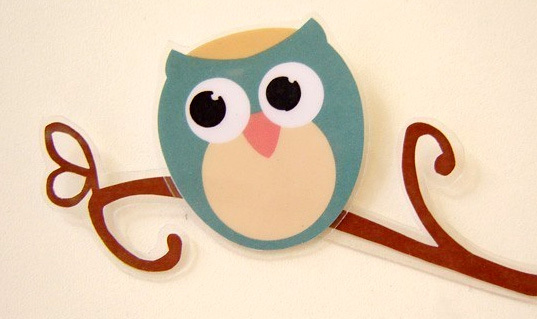 Your child is sure to be the only designer tot in the neighborhood with such magical art on his or her walls. Etsy shop owner Munieca's delightful paper prints, illustrations, and collages are comprised of animated colors and simple designs, making them perfect patterns for any child's space. These silhouetted creations are child-friendly, but not childish - meaning parents will love living with them too. The nature-inspired Patterned Birds print (above) is an original Munieca digital illustration. 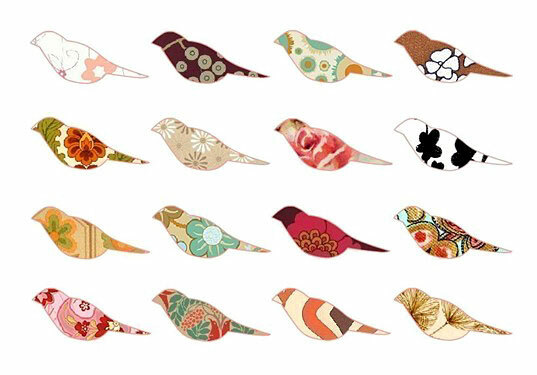 Recycled retro patterns are used for the colored feathers of the birds, and all images are sent by the designer, ready to be framed and displayed. Decorating babies and kids' rooms has limitless possibilities, but we love unique designs such as Munieca's, which foster imaginative thinking and cultivate an affinity for the natural world.